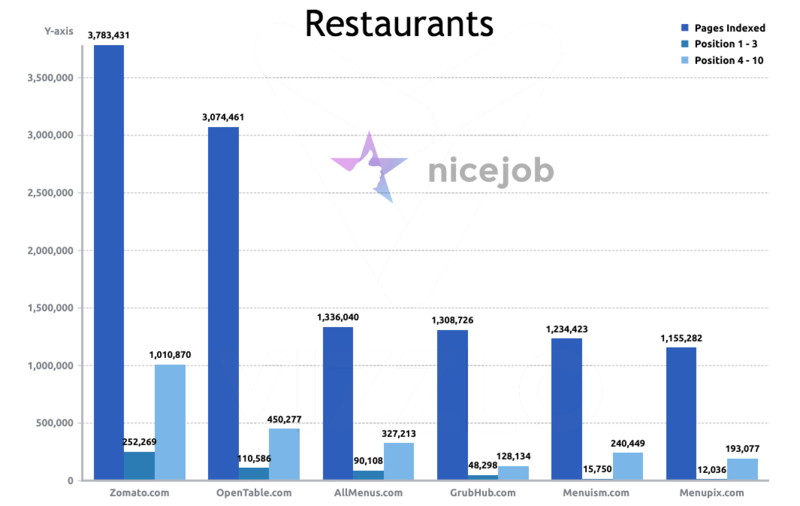 Which review sites are considered most important for your industry? With all the different review sites, we wondered which ones might be the most important for different markets. By looking at the review websites and how they appear in organic search results, it can help businesses get an idea of which might be the most important for them. Since it takes more time to monitor every possible review website, knowing which ones perform better can help businesses choose. So we took at look at what we thought were the biggest of the reviews sites for several of the most popular markets. When it comes to organic search results, if you're not on page one, you're practically invisible. 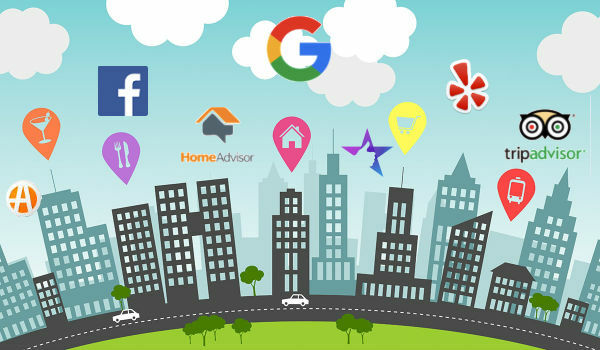 For the big 3 (Google My Business, Facebook and Yelp) we were not able to examine Google My Business and Facebook independently. 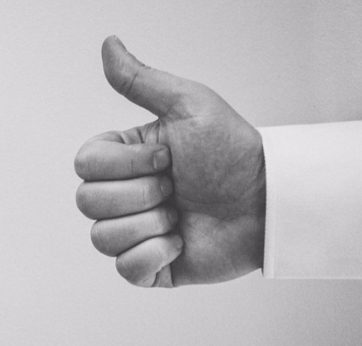 Any business concerned with reputation management should monitor and manage these three. But the following info provides insight for other review sites to consider managing in your market. Below you will find a series of charts that include the following details per site, with 3 columns. When looking at the charts, it's the middle column (Positions 1 - 3) that is the one to pay particular attention to. This, and the column to the right of it, represent organic traffic and page one results. Depending how search results are displayed, the clickthrough rate (CTR) can vary, but the top results have always received the majority of clicks. We also included the overall amount of indexed pages as it's interesting to see as well. 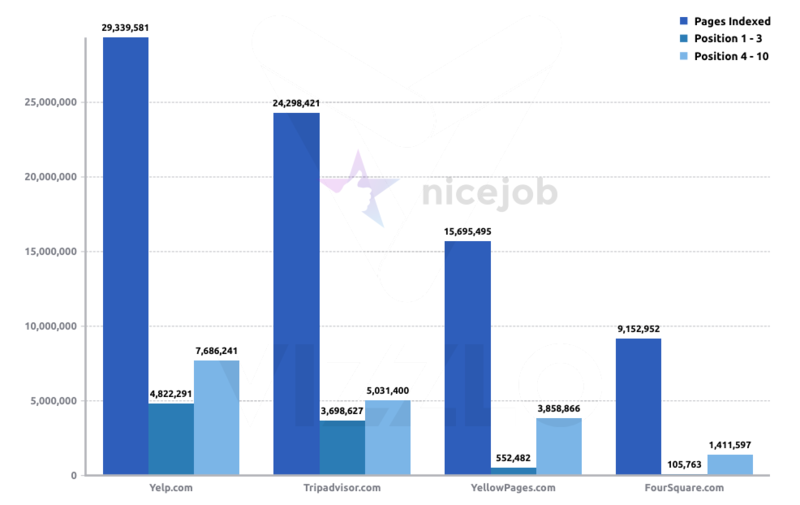 So we looked at the total number of pages indexed (top 100 results) along with rankings for page 1 (top 10 results) to determine which review websites might perform better for businesses that want to select a few to manage. This study only references Google for search engines, and is based on US search results. 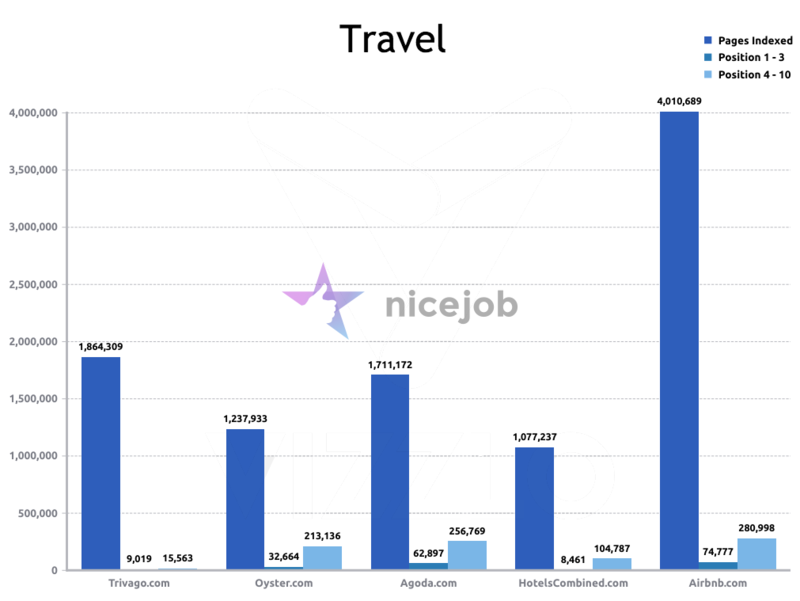 The above shows that Yelp has significantly more pages on page 1 of Google, with about 34% more than TripAdvisor holding the top 3 positions. Yellow Pages was a surprise and did not hold as many top 3 positions as expected. Between BBB, Manta, Local.com and CitySearch, it was BBB that held more top 3 listings, with Manta holding more positions between 4 and 10. CitySearch turned out to be surprisingly lower than expected. It came as no surprise that HomeAdvisor holds more top 3 positions than the others. 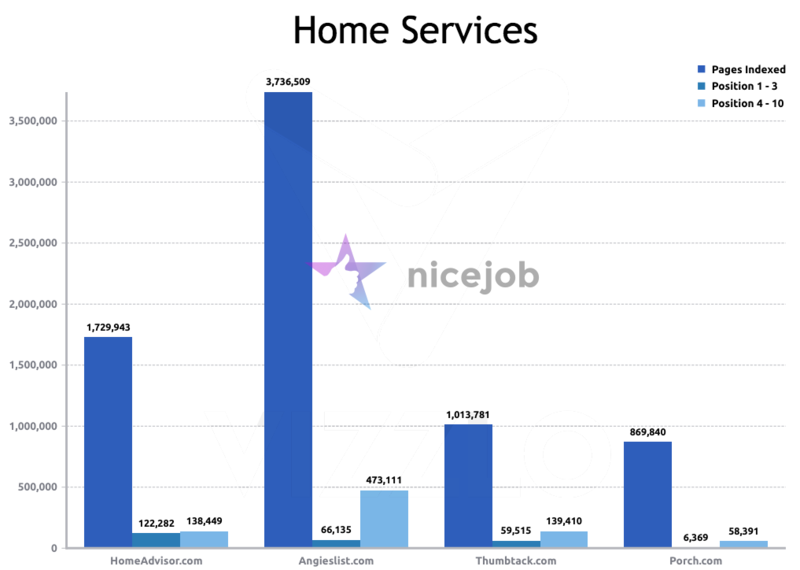 Angie's List has a significant amount of pages indexed, but less than half for top 3 positions when compared to marketshare in Home Services for HomeAdvisor. ThumbTack followed close in third, and Porch.com trailed behind. 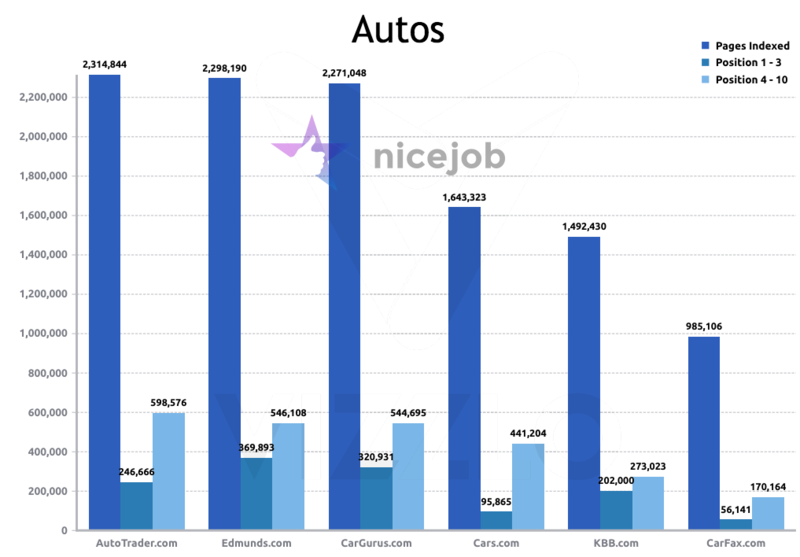 When it came to auto review sites, one might have presumed AutoTrader to take the lead, but it turned out that Edmunds and CarGurus hold more top 3 positions. 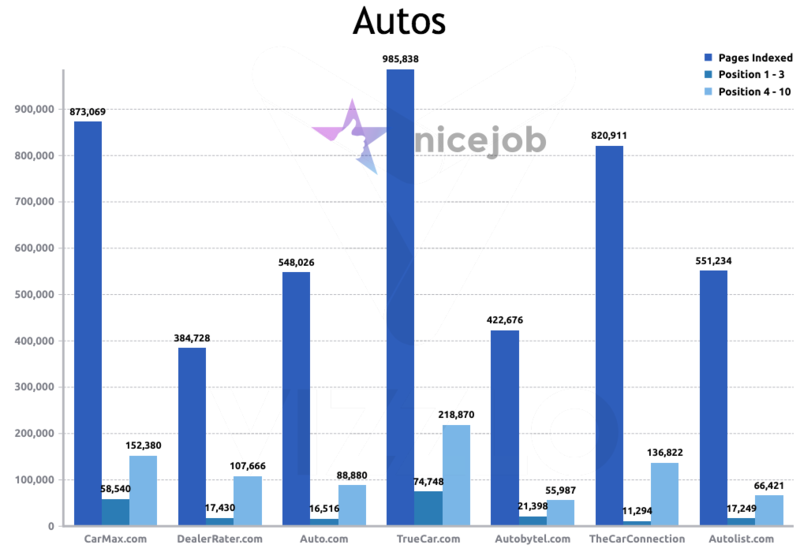 But AutoTrader did have the most rankings for positions 4 to 10, making a tight race between the three that could possibly fluctuate monthly for the lead. With the second tier group of car dealer sites it was CarMax and TrueCar that stood out. 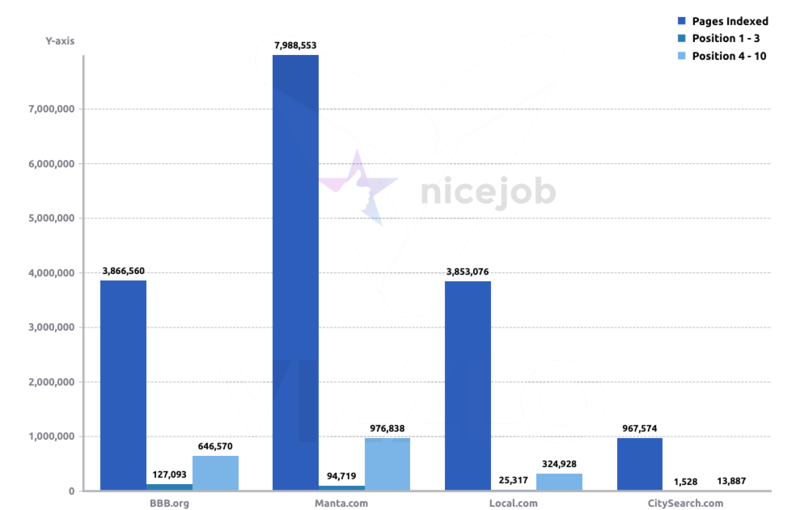 The clear winner for real estate review sites was Zillow, with more than twice as many rankings in the top 3 positions compared to it's closest competitor. 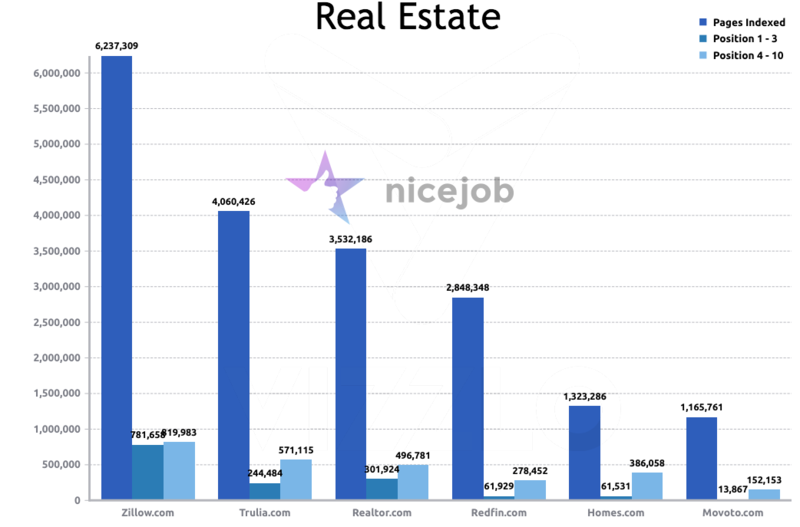 Realtor.com came in second, with less than half the top 3 listings of Zillow, but a clear lead over Trulia, it's next closest competitor. 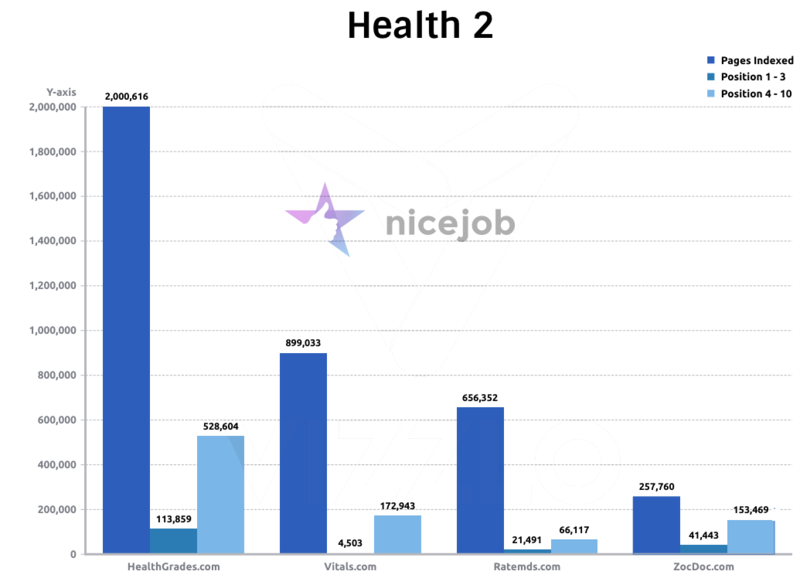 For health review sites, it was Health Grades that was the clear leader over the other contenders for this category. 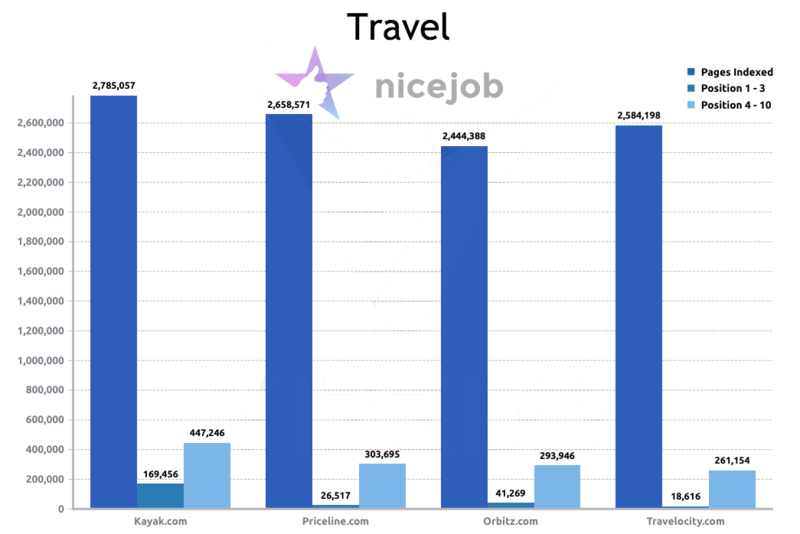 The clear winner for travel review sites came as no surprise, with TripAdvisor holding almost ten times as many top spots for positions 1 to 3. 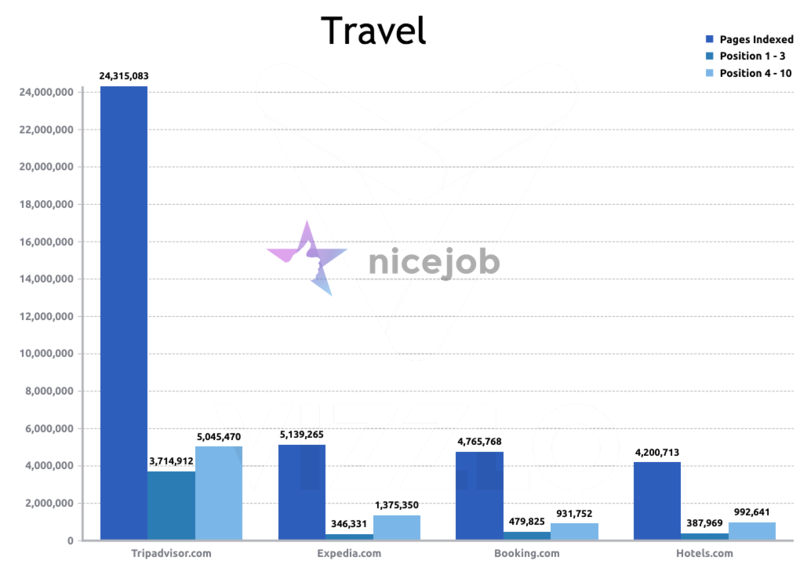 The runner up was Booking.com, but it's worth mentioning that Booking spend a substantial amount (over $1b annually) on paid search as well. 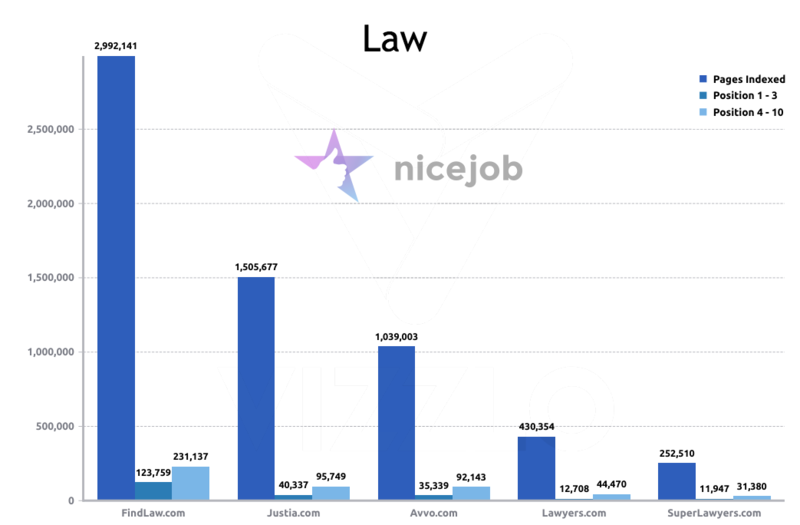 In terms of law review websites it was FindLaw that was the winner, with 3 times the top rankings of Justia which came in second, and Avvo in third.